During the last decade (i.e., the sixties), international qir’aat competitions have become a regular feature in the Muslim World. These competitions, in which well-known qura’ from different countries have been participating to display their remarkable talents for the recitation of the Qur’an, have served a number of purposes. The large audiences who have been listening spell-bound to the recitations of the world-famous qura’ have always been moved by the unique melody, eloquence, and grandeur of the Qur’anic diction. This may have, temporarily, strengthened their belief in the Divine origin of the Qur’an. Moreover, these competitions have popularized tajweed (i.e., the art of reciting the Qur’an with correct pronunciation) in Malaysia, Indonesia, and Pakistan. The Muslim children in these countries today can recite the Holy Book with much better accent and intonation than they could possibly do a few years ago. 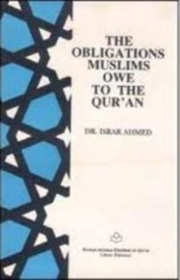 Therefore, instead of making a presumptuous attempt at describing its unique merits, the most pertinent thing for us to do is that we should clearly understand our duties and responsibilities towards the Qur’an and then see whether or not we are conscientiously fulfilling these duties and responsibilities. If we find that we are not doing so, we should seriously think about the line of action we should adopt for their fulfilment; and then adopt the line without any further delay because our very salvation depends on our efforts in this direction. Paying pompous compliments to the Qur’an will not be enough and it cannot be a substitute for actually discharging our obligations towards the Holy Book.